Molluscum contagiosum is a viral disease of the skin. It causes small pink or skin-colored bumps on the skin. It is not harmful and usually does not have any other symptoms. The virus is inside the bumps and is mildly contagious. These bumps usually go away on their own over an extended period of time. Molluscum contagiosum is caused by a virus called the poxvirus. It is most common in children and adolescents, although it can affect adults. The virus usually is spread through skin-to-skin contact with an infected person. People with weakened immune systems, young children, and people living in warm, humid climates are less resistant to molluscum contagiosum. The bumps are small and are usually pink or skin-colored. Eventually, the bumps tend to develop a small sunken center. The lesions can form alone or in groups or clusters. They are not harmful, but may cause some cosmetic concern for the individual if they appear on the face or other visible areas. 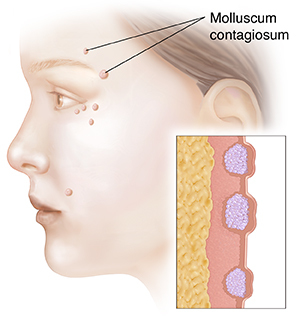 Molluscum contagiosum is usually diagnosed based on a medical history and physical exam. The lesions are unique and are usually diagnosed on physical exam. Additional tests are not routinely ordered, though occasionally your healthcare provider may want to perform a skin biopsy to confirm the diagnosis.